Every year we carve a pumpkin for Halloween, and it usually takes us a while to figure out a design. 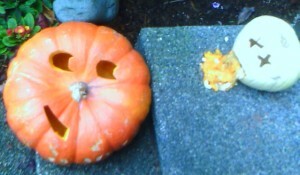 This year the kids weren't very into it, so I thought of this -- the first ever emoti-pumpkin! Just had to share the pictures of the pumpkins we carved last night. The one on the right is puking, and the one on the left is laughing at it -- my kids' idea! Yes, maybe they are a little twisted (like me). July 4th is in my top 3, in terms of favorite holidays. Not because I'm patriotic, but because July 4th involves fireworks and I love fireworks. Not just seeing them, but also blowing stuff up, making noise, the smell of black powder, etc. all in the name of celebration. I know it's shallow -- kinda like appreciating Christmas for the presents, and Thanksgiving for the meal -- but there's also the deep appreciation of family around 4th of July too. For years now, Jenny and I have been taking the kids down to the Kirkland waterfront to watch the fireworks show. If you sit in the right area, you can also see the fireworks at the Space Needle, Gasworks Park, Bellevue and then all the individual shows at Carillon, Hunts Point, etc. This year we did the same, arriving early to get a good seat. Hannah met up with a bunch of her friends and had lots of fun. Hunter and I went for ice cream, walked the docs (looking at the cool boats) and then climbed every tree we could. All part of the waiting, the anticipation -- for when darkness comes and the fireworks finally start. Well the fireworks started, but within minutes we all agreed that the Kirkland display was the worst it'd ever been. Not nearly as good as any of the other displays we could see at the same time. I really like sonic booms and feeling that thump against my chest -- well, the damn barge was SO FAR out in the water that it took a full 2 seconds to hear what we were seeing. So not only was the display way too low in the sky, there was no thump in the chest! And the finale was over in about 3 seconds. Next year we're going to Lake Union. Ok, so I never knew what "pulled pork" was before. And I don't frequent barbeque restaurants all that much (obviously?). So in early April when our family was in Tennessee visiting my sick mother-in-law, and someone suggested we eat at "Leo's Pulled Pig" in Lenoir City, I said Leo's Pulled WHAT? Sure, why not! This place rocks, and I am now a pulled pork fan. Later in the month, when we all went back to Tennessee for the funeral, Kevin and I offered to pick up a bunch of food from Leo's Pulled Pig and bring it to the wake. To my surprise, they still remembered us (three weeks later!) and even threw in 3 pounds of pulled pork for free. Not only great barbeque, but nice nice people. We gave them a helluva tip. And this time I also tried their Smoked Corn and their Ribs -- damn, it was good. A couple nights later we went to another restaurant which claimed to be the most famous or best barbeque in Tennessee, and it was horrible compared to Leo's Pulled Pig. Leo's Pulled Pig is about 2o minutes southwest of Knoxville, in Lenoir City on 312 West Broadway, only probably a few minutes off of I-75. On the 14th of December 2006 (early evening), a wicked windstorm hit Seattle. I was up most the night, listening to the wind roar and trees/branches break around us. By the morning of the 15th, over 1M people had lost their power. I drove Jenny to the airport that morning and the ONLY area I saw with power was Seatac and a little bit of Renton. It was amazing how many trees had fallen and mangled houses, cars, power lines, etc. We had three trees down around out house and many many branches, so we all spent a few hours working outside. We cleaned up the fallen tree branches, and started sawing up one of the trees that fell. Turns out it was dead and made for very good firewood! Before dark came, we prepared all our flashlights and candles, got all our camping gear out, and figured out what we were going to have for dinner. Best to use all available daylight to prepare for night, when it gets so much harder to find things! About 4pm, when darkness fell, Hunter and I made a fire. He of course loves to play with the fire and I never miss an opportunity to teach him how. By that time, we had a nice stack of firewood ready to go, along with some firestarter from the camping gear. The wood was good, but not THAT good so it took a little coaxing -- which I assigned Hunter to do. In the meantime, I filled both our coolers with perishable items from our refrigerator and set them outside on the deck. It was only about 38 outside and I knew that it was going to be close to freezing that night -- colder than the fridge. I left the freezer alone. As dark fell, it began to get quite chilly in the house and we knew it would only get colder. So I had the kids put on their long underwear and I gave them each Patagonia Synchillas (sweaters) to wear, which stopped them from complaining about the cold. We made dinner using the outside grill and the propane campstove (indoors). The coleman lantern kept the kitchen bright enough. The kids read books while I cooked. After dinner we cooked s'mores over the fire, using the sticks we carved during the afternoon. We had never had s'mores at home before, so it was a nice treat and killed another hour. By 7:30pm we were ready for something else, and the kids were all jacked up on sugar -- so I suggested a game of "fear factor". I would hide down in our bedroom and they had to come find me, WITHOUT their flashlights. They thought that was cool until I started making scary noises! They chickened out a few times, and then I suggested they hide on me -- I tell you, it is very suspensefull and thrilling to be walking around in the dark looking for someone you know is there getting ready to grab you! Then we played Life (the board game) by lantern. This kept us busy until about 10pm at which point we all went to sleep in my bed, under comfy piles of quilts and such. When we woke up in the morning it was 56 degrees in the house. The power stayed out for several days, so we ended up driving up to Bellingham to stay with my parents. We were lucky to get our power back in 3 days. Most of our neighbors went 5 days without power, and some people in the Seattle area were out for a week. Took Hunter and Hannah camping on the Yakima River this weekend, and we had a great time. Highlight was seeing a rattlesnake on the way down from this hike at Umptanum. I got close and was warned with a rattle, then we all got a good look at it. So cool. Oh, and fishing was nothing to write home about, due to water being high and murky. We're proud to announce a new member to our family. His name is Skye, he was born on Feb 1 2006, he's about 15-16 pounds, 10-12" at the shoulder, and is completely overwhelmed at being removed from his litter mates, and driven to our home. You can see a small video here (2.8MB). Skye is a Goldendoodle. This breed name is quite wrong to me -- I think of either a strange sexual fetish or a new quilting/stitching method -- so I just tell people that it's a Golden Retriever and Standard Poodle mix (true of course). All the benefits of an intelligent and highly trainable hunting/family dog, with none of the smell or shedding -- that's the value prop. We got him Monday and so far no accidents, no chewing incidents, and he's almost sleeping through the night. A sweet little guy, for sure. Isabelle (our cat) seems to be doing just fine too -- no retaliatory shits in the closets yet! Well, I must say that 2006 started out with a great omen. Drove Jenny to the airport this morning, and in both directions (there and back) I had nothing but green lights -- every single light was green for me, for over an hour! That's about 12 lights? And at roughly 9-10am, it wasn't even that early.